We lost the Purple Rocker today. Pretty sad. This isn’t a bandwagon post; I didn’t just become a fan following his death. 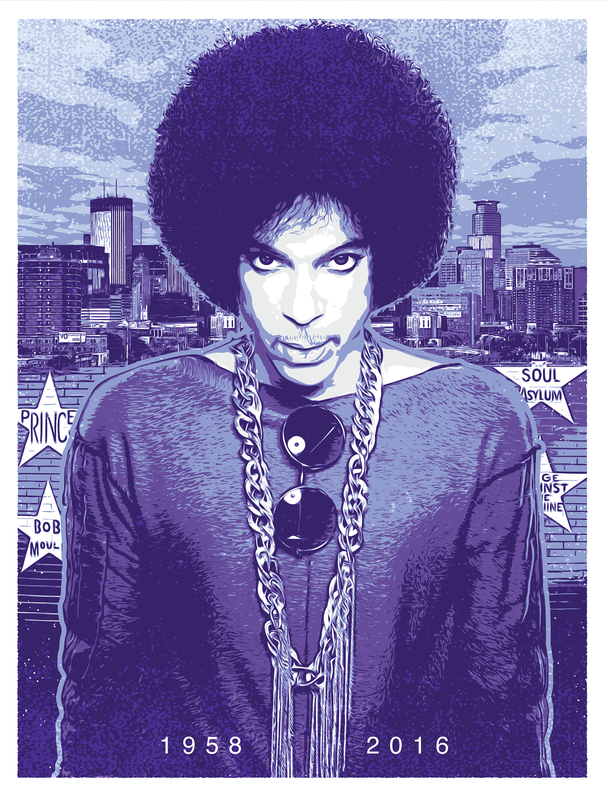 Though I currently live in Seattle, I spent the last 13 years in Minneapolis, and it’s hard not to be influenced by Prince and the impact he had on the music scene of the Twin Cities. That was some good sh!t. As a tribute, I decided to put together this poster graphic. Lots of purple there. A bit of First Avenue‘s star wall in the background. They’re doing an All Night Dance Party this Saturday, April 23rd (NO COVER!) to honor him. That’s frickin’ awesome–wish I could be there for that. But damn, this is so sad. A friend of mine, angvogt, once told me a story about driving past Prince’s mansion with a friend, and there appeared to be an open house going on. They proceeded to park their car and enter his home to see what was going on. Security stopped them at the front door (it wasn’t an open house). They were politely turned away, but apparently even the entryway to his home was every bit as purple as you’d assume. And finally, here’s a great video of him jumping on stage for a guitar solo. Dude could rock. RIP, Prince. You’re already missed. UPDATE: I had to change the previous video I posted after seeing this one. Much better representation of the Purple One’s skill. Credit to Jamie Penick for posting this on his own Facebook page. Posted on April 21, 2016 April 22, 2016 by Well of MikePosted in Fan Art, Mi Gallery, UncategorizedTagged #Batdance, #minneapolis, #prince, #purpleyoda, #RIPPrince, #twincities, poster, vector. Previous Previous post: Erin Go Bragh!